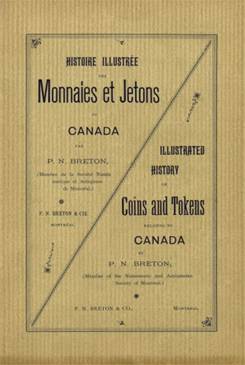 This book is a full reprint of P. N. Breton's 240 page catalog entitled "Illustrated History of Coins and Tokens Relating to Canada", first printed in 1894. Even though this guide is nearly 120 years old, its still a valuable reference today for collectors of pre-confederation coinage. Originals, which are hard to find, can cost anywhere from $50.00 to $125.00 or more, and are difficult to use due to the age of the paper which has become brittle and fragile with time. Reprints, which can cost between $25.00 to $50.00 or more, are equally hard to find. 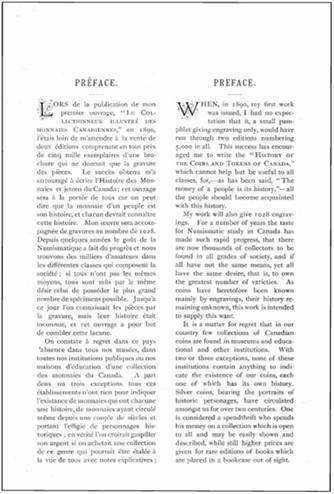 So, to provide modern day collectors with increased access to this publication in a robust paper back edition, which also gives insight into the early history of currency collecting in Canada, Brookstone Publishing™ has reproduced as closely as possible, an original copy of P.N. Breton's 1894 catalog. Not only can serve as a reference for many coins not documented in any other books, guides or publications; but it also provides a brief history of the coins used in Canada from as early as 1670, all the way up to 1894. ● Over 1000 obverse and reverse engravings of coins and tokens used in Canada from 1670 to 1894, and the rarity scale used to set coin valuations in the late 1800's. 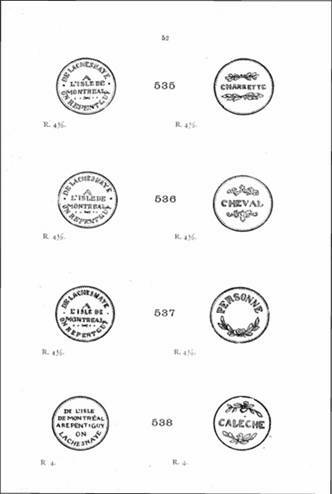 ● The Breton numbering system regularly used by collectors and dealers of pre-confederation coinage, which runs from 500 to 1013. ● The prices paid for the most rare coins, one of which is the Specimen Pattern $20 gold piece issued by the Government of British Columbia in 1862, which would now trade for several hundred thousand dollars. ● Biographies and insight into some of the prominent collectors of the period and insight into the collector world of the late 19th century in Canada. ● Engravings of coins once only worth face value, but today regularly trade for thousands of dollars to tens of thousands of dollars. ● Numerous commentaries on the origination of many coins, how many were minted, composition and so on. ● Limited engravings and listings on paper money used as early as 1714. Below are illustrated two pages from inside P.N. Breton's 1894 catalog. As shown in the contents page, coins are listed from a wide variety of sources. Many of the private coins (or tokens) found in this catalog are not listed in other sources, due to their rarity/scarcity and limited trade. In the 20th century, collectors shifted away from trading these tokens to trading the large mintage business issue coins of the nation. No doubt this is a factor in why modern day catalogs do not list many of these private tokens. So, for those collectors needing reference material for private tokens of the 19th century, P.N. Breton's calatog fills that need. 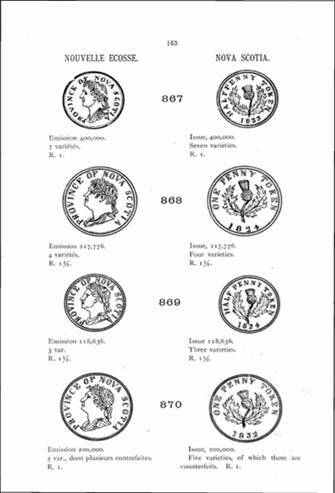 200 of the approximately 240 pages found in P. N. Breton's 1894 catalog entitled "Illustrated History of Coins and Tokens Relating to Canada", contain engravings of the obverse and reverse sides of many different coins used in Canada during the 1800's, and earlier. While many of these coins are familiar to most collectors today, there are even more that are not. 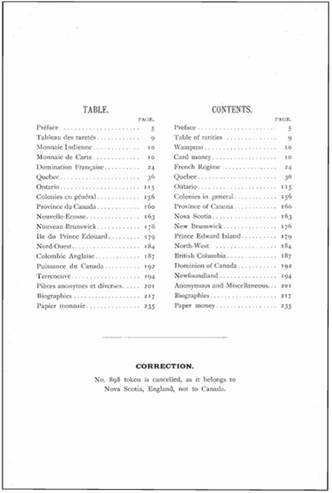 Hence, this book can be a useful reference for anyone interested in knowing more about pre-confederation coinage used in Canada, and having a reference for the Breton numbering system. Below are two sample pages of what you will find in this book.